Hot stone massage is a speciality massage where the therapist uses smooth, heated stones, either as an extension of their own hands or by placing them on the body while they massage other parts of the body. The heat can be both deeply relaxing and help warm up tight muscles so the therapist can work more deeply, more quickly. Aromatherapy massage uses essential oils derived from plants to affect your mood and alleviate pain. In aromatherapy massage, essential oils are mixed with a carrier oil like sweet almond, apricot kernel, or grapeseed oil. The massage therapist uses up to five oils in a mixture and chooses the oils based on what you need. A relaxing aromatherapy massage, for instance, might have lavender or bergamot, while a massage for sore muscles might include peppermint and eucalyptus. Reflexology is a spa treatment where the therapist works on “reflex points” on your feet, hands, and head (especially ears). The theory behind reflexology is that these reflex points relate to specific organs and glands in the body, and stimulating those points with finger pressure promotes health in those organs and glands via the body’s energetic pathways. Indian head massage is a technique of manipulating soft tissues on the shoulders and scalp, moving upwards from the back into the shoulders & upper arms. This helps release tension in muscles to release stress & tensions. Exfoliation to banish breakouts & blocked pores. 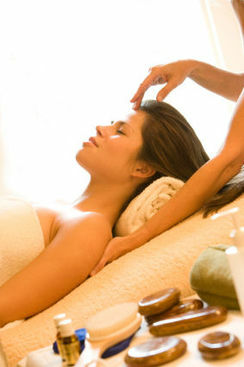 Treatment includes a massage to aid lymphatic drainage plus a purifying masque & moisturiser to help combat dehydration.